Rogar has become a leading manufacturer in pot racks for more than two decades. Rogar Pot Racks are USA made products using high quality steel. Rogar Hanging Pot Racks and Wall-Mount Pot Racks come in all shapes, sizes and colors. Wall mounted bar racks for pots, pans, and utensils. 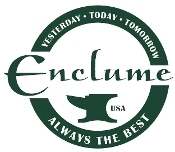 Enclume has been the leading manufacturer of gourmet cooking racks for nearly four decades. Renowned for unmatched quality and craftsmanship, our pot racks have been sought out by America’s cooks for the many advantages they bring to their kitchens. Find hanging pot racks in all shapes and sizes for your kitchen. 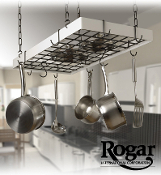 Buy Rogar hanging pot racks from large oval racks to gourmet rectangle and oval pot racks. Also featured here at Kitchen Wine and Home are hanging bar racks along with ornamental expandable kitchen racks.